I hadn’t gone to Wembley to take photographs, but to go to the opening of a show by an old friend in a community arts centre. It was getting dark as I ran across the road from Wembley Park station and jumped on a bus. I’d come from photographing a couple of protests, one by Sunni Muslims opposite the Iranian Embassy with Anjem Choudary – Iran ‘Release Sunnis, Don’t Hang Them’ -and a larger event in front of the National Gallery in Trafalgar Square against cuts in funding for the Arts – Human Chain over Arts Cuts, so I was carrying my camera bag, and quickly pulled out the D800 to take a picture looking down Olympic Way from the top deck. It’s a view that certainly benefits from the extra height, and I’m always disappointed when going by bus if the service isn’t on a double-decker, as the views are generally so much better. I don’t much like the new Wembley Stadium and haven’t ever photographed it properly, though it is certainly a landmark that can be seen from many places in West London. The only other picture I can recall taking was from the roof of a nearby building that was being occupied against the building of an unwanted academy school in 2008. Perhaps one day I’ll go and photograph it properly. By the time I left the exhibition opening, fortified by a couple of glasses of red wine, it really was dark. Again I got on the top deck of a bus, and again saw a view with arches, though one that seemed rather more interesting. 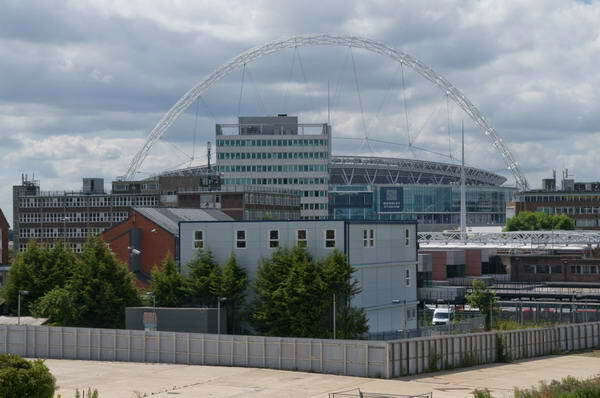 Its rather a pity that Wembley Stadium station doesn’t get more trains. There were after all three arches, not just one (you can see just a little of the stadium arch at the left too.) But really it was the colour that caught my attention. Of course many photographers have worked taking pictures from buses, including an interesting series of panoramic images of London High Streets by another of my friends, Mike Seaborne. 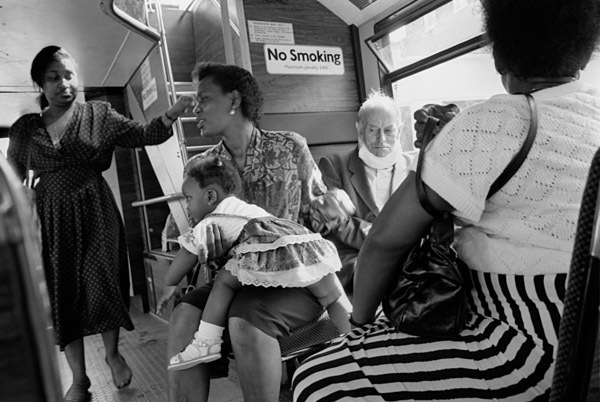 And I – like others – have taken pictures of people on buses too. But there are problems in taking pictures through bus windows. Bus companies don’t generally clean them very often, and while one can wipe the inside, the outside windows on the top deck are too high even if you could get the driver to stop while you gave them a polish. All you can do is to choose your seat carefully and then put the camera lens close to the cleanest patch you can find. Vibration is a problem if you actually let the camera lens rest on the glass. Some bus windows shake so much it must be a design feature. Keeping a gap between the solid parts of the camera and lens and the glass is essential unless you like a bit of blur. But if the camera lens isn’t on the glass you will get unwanted reflections. You can see a little at top right of the top image on this page. I generally remove the lens hood to get the lens closer and hold around the lens with a hand which can rest on the window but absorbs the vibration while cutting down reflections. A better solution which I used to use was a rubber lenshood. It’s hard to avoid reflections unless you work more or less perpendicular to the glass, and working at a close distance cuts down the effect of spots on the window. I spend quite a lot of time travelling in London on buses, not least because I now can travel free, while on the tube or overground I have to pay. But it’s generally a more interesting way to get around, though often rather slow. I’ve often thought that when my legs get too tired to walk much (and I think they are wearing out fast) I might spend some time photographing London from the bus. This entry was posted on Friday, November 1st, 2013 at 08:20 am and is filed under My Own Work, Photo Issues. You can follow any responses to this entry through the RSS 2.0 feed. You can leave a response, or trackback from your own site.